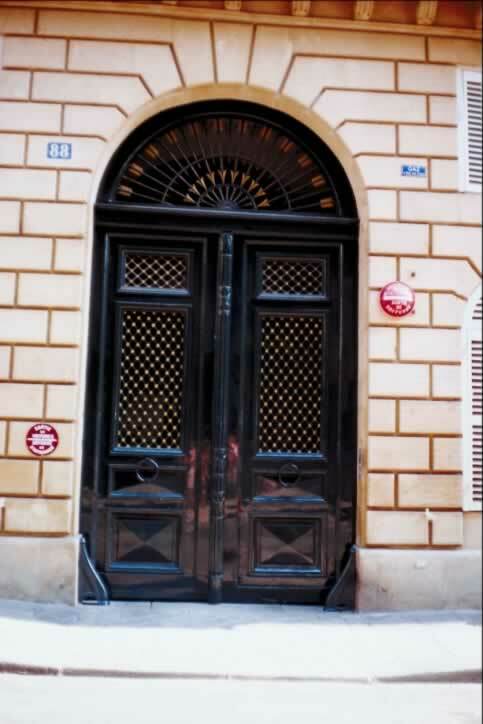 These glossy black exterior double doors and the fanlight fill the beautiful arched doorway to this urban building. The fanlight (semi-circular window located above the doors) has a very usual grille protecting its glass. The grille is composed of twelve arrows with bronze tips and feathers. The arrows' tips are jointed at the center. Each door has four panels. The first and third panels are the same size; however, the top panel is a window (called a lite when the window is in a door). The lite has been fixed with a bronze grille or screen, which adds both security and privacy. The second and largest panel is also a lite and has a grill of the same material and color, but the pattern's direction has been switched. The bottom panel is raised. Each door has a large metal ring affixed to the door's mid rail.